This family is an assemblage of four genera of direct-developing frogs found throughout the West Indies, in peninsular Florida (where it may be either native or introduced), and from southern Texas (USA) south to northwestern Ecuador, with some genera in northeastern South America and in the Amazon Basin. Frogs of the family Eleutherodactylidae range in size from 10.5 mm snout-vent length in female Eleutherodactylus iberia to 88 mm in female Eleutherodactylus inoptatus (Hedges et al. 2008). 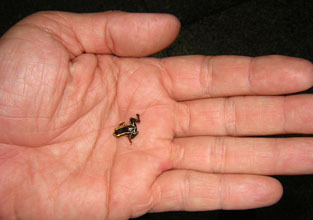 Eleutherodactylus iberia is one of the smallest frogs in the world. Miniaturization has occurred across five families of frogs (Brachycephalidae, Eleutherodactylidae, Leptodactylidae, Microhylidae, and Sooglossidae), and with it come constraints in morphological development, including digital reduction and loss of vomerine teeth. Miniaturized frog species also tend to have high-frequency calls (>5 kHz) and to have clutches with very small numbers of eggs (sometimes only one egg). An unusual species is Eleutherodactylus jasperi, the only ovoviviparous eleutherodactylid, which retains developing embryos within eggs in the oviduct, giving birth to live froglets. This species is endemic to southern Puerto Rico, but is thought to be extinct as it has not been seen since 1981. Distribution through the Caribbean, including Florida and southern Texas in the United States, Central America and south to Ecuador, and the Amazon Basin in Brazil. Hedges, S. B., Duellman, W. E., and Heinicke, M. P. (2008). New World direct-developing frogs (Anura: Terrarana): Molecular phylogeny, classification, biogeography, and conservation. Zootaxa 1737: 1-182.